The last few weeks have been hard, mainly because Joshua has been so unwell with his milk. 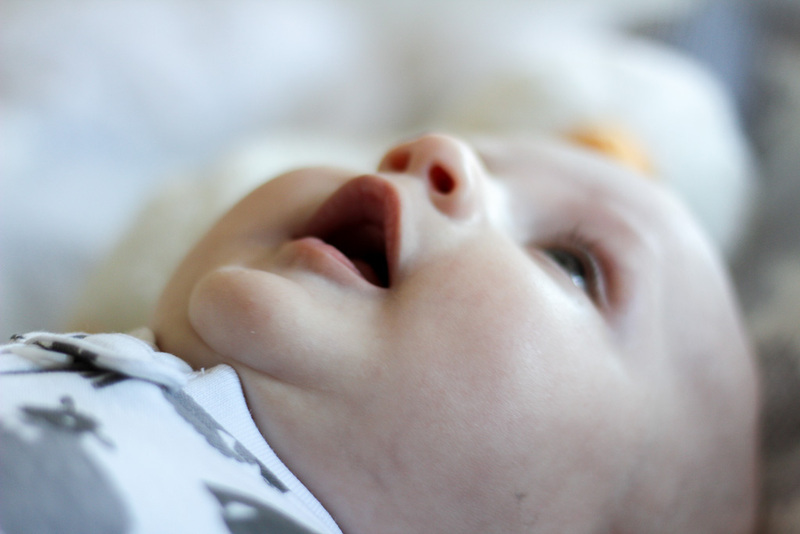 I spoke in his two month update about how he's gaining weight and feeding well but after continued colic attacks or at least what we thought were colic attacks we discovered he had a milk allergy. We're currently in talks with our health visitor to discuss allergy testing but as he was displaying similar symptoms to myself as a baby and after talking at length about how he was with her, she was in agreement with us that we had to do something as he was in agony. Our GP was absolutely awful and so unhelpful when all I wanted was reassurance that we doing the right thing but one thing I've learnt is that guidelines really are just guidelines and we should always trust our gut when it comes to our son. 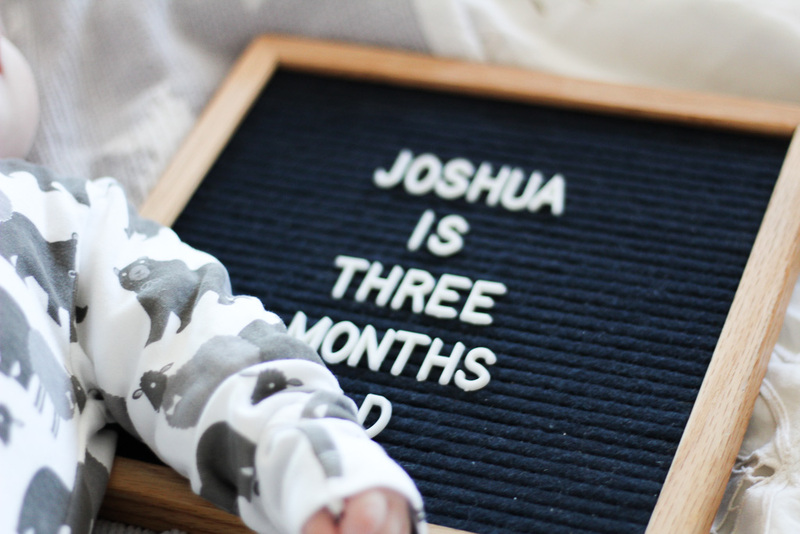 Joshua is now on soya milk, something we are fully aware isn't recommended for babies under six months but it is perfectly safe from birth and do you know what? We made the right decision. He has been on soya milk for just over a week now and he's so much better, he's not in pain and we have our happy little baby back, something we haven't seen for weeks as he's been so poorly. It may smell pretty gross and I already miss his milky sweet breath but he's happy and fed, all 15lbs of him. As well as our milk troubles, Joshua has started teething but nothing that a bit of Calgel won't fix. Unfortunately due to the suspected milk allergy we can't use the powder sachets as they contain lactose and we don't want to risk more upset to him. This baby lark is hard! Sleep is still good, although we are in leap four now even if I'm a bit skeptical about Wonder Weeks, so we're expecting a change and we keep being reminded of the four month sleep regression. At the moment the bedtime routine works. It's bath, change and bed where we then say goodnight and he settles himself while we sneak away. He's become so much better at this the last few weeks so before the regression kicks in we're going to enjoy this and our ten hour snooze with one feed. Joshua can now fit his whole fist in his mouth, grab fistfuls of my hair and has perfected the art of blowing raspberries. Tummy time is still the worst thing in the world but we're persevering and we've been to a baby class I didn't hate. It's been a month full of learning new things, he grabs his toys now, kicks the hanging toys on his play mat and is finally starting to love his bouncer. Bath time is also the best time because it means splash splash splash and he laughs his little head off. I can't see him staying in his Angel support much longer though as he kicks his legs so hard he nearly comes out of it which is hilarious to him. Seeing him smile and laugh warms my heart so much, especially when Arran comes home from work and Joshua realises who is reaching out for cuddles. Now I'm finally starting to feel myself again, I feel like I get this now, I can do it and as long as Joshua is happy, clothed and fed, we're doing alright. There really isn't much else to worry about. My niece is about the same age as Joshua and she loves bathtime, she either laughs her head or chills out the entire time. I have a theory that the warmth of the water surrounding babies reminds them of being in the womb so they naturally fell comfortable in the tub. Glad to hear that the milk issue is getting sorted out - it's the absolute worst seeing your little one having stomach pains and not being able to do anything about it. Wow that was quick! You are doing such a wonderful job. I can't believe Joshua is 3 months old now! It seems so scary that our babies are growing up! I'm so happy you've decided to give him whatever he's happy on and I can't believe how shoddy your help has been with the whole milk situation at the doctors. it's ridiculous! That’s great news! So happy to hear he’s settling and you have found an alternative that works for him.